Yummy! One of my FAVORITE treats over the holiday season is the Peppermint shake from Steak N Shake. Right, now you can grab a SUPER SWEET deal and Buy one get one FREE. 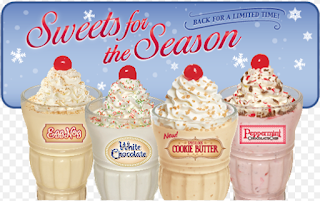 To score your Buy one get one FREE Steak n Shake Holiday Treat, visit the Steak N Shake Facebook Page. Its HERE that you'll print your coupon, which is valid through December 20th.